Lightweight-but-solid, the kubotan is designed for melee strikes, compliance moves and joint locks. Measuring about 5.5 inches long and featuring a grooved surface that allows a strong grip, even when your hands are wet, the kubotan is the ideal key ring accessory for inflicting blunt force trauma in a self-defense situation. 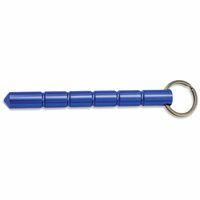 The key ring is firmly attached, which allows you to use this handy personal safety device as a key flail as well. 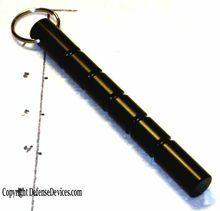 DefenseDevices.com offers a kubotan made from aluminum in black finish. The kubotan is a smart choice for close-quarters combat. 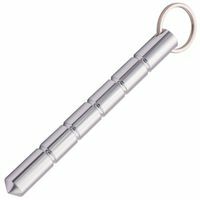 You can use yours for hardened fist punches, pressure-point attacks and several other self-defense techniques to ensure your safety when you are under attack. The kubotan is an economical, reliable addition to your self-defense arsenal. Also available is the Defender metal kubaton (p-15940) with glossy surface and solid colors. This item is lightweight aluminum, very sturdy and hits like a ton. The barely pointed tip concentrates your force into a smaller area making the blow much more painful and effective. 5.5 inches long and weighing 2 ounces these can be carried with or without keys and hardly take up any space in your pocket. You could just carry one key, like a locker key or garage key to complete the disguise. Available in black,pink, purple, red and silver. We also have a blunt model that is a tad shorter, about 5 5/16 inches long if you prefer.See the drop down menu to choose.